Imagine customers diving, on their own, straight down to the bottom of the sales funnel. Actually, don’t imagine it. Welcome it, because it’s coming, in the form of leads that customers generate themselves, when they’re ready to buy something. Here in the VRM world we call this intentcasting. At the receiving end, in the CRM world, they’re CDLs, or Customer Driven Leads. 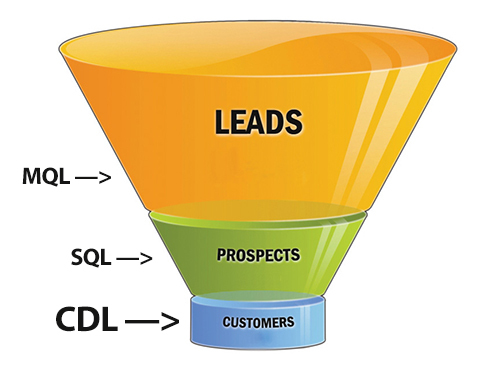 Because CDLs come from fully interested customers with cash in hand, they’re worth more than MQLs (Marketing Qualified Leads) or SQLs (Sales Qualifed Leads), both of which need to be baited with marketing into the sales funnel. CDLs are also free. When the customer is ready to buy, she signals the market with an intentcast that CRM systems can hear as a fresh CDL. When the CRM system replies, an exchange of data and permissions follows, with the customer taking the lead. The first protocol-based way to generate CDLs for CRM is described in At last, a protocol to connect VRM and CRM, posted here in August. It’s called JLINC. We’ll be demonstrating it working on a Salesforce system on VRM Day at the Computer History Museum in Silicon Valley, on Monday, October 24. VRM Day is free, but space is limited, so register soon, here. Iain Henderson, who works with JLINC Labs, will demo CDLs on Salesforce. We also invite all the other CRM companies—IBM, Microsoft Dynamics, SAP, SugarCRM… you know who you are—to show up and participate as well. All CRM systems are programmable. And the level of programming required to hear intentcasts is simple and easy. We’ve reached the point where VRM and CRM developers are ready to talk. There is a lot of CRM-facing development going on in the VRM community. A number of both commercial and non-commercial projects on this list are involved, and some are far enough downstream that folks in both communities need to show what they’re working on, sit down and talk. Some of this is already happening. More will happen next week in New York. And more will happen in some other gatherings that are in the works. Stay tuned for those. You are on the left. The seller is on the right. And the market is in the middle. The VRM community is working on building this out. (As we said above, the CRM community has begun to join the effort as well.) We are doing this by creating ways of relating in which both sides are open to the other, but neither contains the other. The two can have attractions toward each other, but engagement is optional. Think of the result as a market that’s far more free than the your-choice-of-silo model. I’m also know people at SalesForce.com, including Marc Benioff and especially my old buddy Steve Gillmor (for whom I can’t find a link currently, so here’s his latest Gillmor Gang, which I was on). Plus people at SAP, Oracle, IBM and Microsoft. (Though in some cases not in their CRM divisions.) I’m looking forward to seeing and talking to many of those folks (and more) over the coming weeks and months. More importantly, I’m looking forward to VRM developers other than myself meeting with their counterparts on the CRM side. And with customers and users of CRM software and services. Meanwhile I’m looking for ways that ordinary users — that’s all of us — can become more aware and mindful of the good work that folks in the CRM community are trying to do. I’m talking here about the work that doesn’t just try to “capture,” “acquire,” “own,” “lock in” or otherwise “manage” us as if we were slaves or cattle. This customer-respecting work is at the leading edge of the CRM world. Respectable customers are at the leading edge of the VRM world. The twain should meet. I should add that there is much happening in VRM that isn’t CRM facing as well. But for the next few weeks, the focus for many of us will be on reaching across and building out the new common ground between VRM and CRM. That ground is the marketplace, and in many ways it’s still virgin and unspoiled territory. For years makers of many kinds of goods and services have provided means for them to monitor how things are going. Now they need to include us in on the action, for the simple reason that we can do it better than they can. That’s the point of Driving by the Numbers, Robin Chase‘s recent op-ed in The New York Times. …sometimes the solution to a safety problem is simply more transparency. Indeed, there is a relatively easy solution that would help identify problems before they affect thousands of cars, or kill and injure dozens of people: allow drivers and carmakers real-time access to the data that’s already being monitored. Most cars now undergo regular state emissions and safety inspections. A mechanic plugs an electronic reader into what’s known as the onboard diagnostic unit, a computer that sits under your dashboard, monitoring data on acceleration, emissions, fuel levels and engine problems. The mechanic can then download the data to his own computer and analyze it. Because carmakers believe such diagnostic data to be their property, much of it is accessible only by the manufacturer and authorized dealers and their mechanics. And even then, only a small amount of the data is available — most cars’ computers don’t store data, they only monitor it. Though newer Toyotas have data recorders that gather information in the moments before an air bag is deployed, the carmaker has been frustratingly vague about what kind of data is collected (other manufacturers have been more forthcoming). But what if a car’s entire data stream was made available to drivers in real time? You could use, for instance, a hypothetical “analyze-my-drive” application for your smart phone to tell you when it was time to change the oil or why your “check engine” light was on. The application could tell you how many miles you were getting to the gallon, and how much yesterday’s commute cost you in time, fuel and emissions. It could even tell you, say, that your spouse’s trips to the grocery store were 20 percent more fuel-efficient than yours. For those companies, keeping that data to themselves — in fact, not realizing in the least that the largest body of intelligence about their own goods and services is out there among the actual users of them — is mainframe thinking at its worst. In 1943, Thomas Watson of IBM famously said, “”I think there is a world market for maybe five computers.” That’s the kind of thinking that IBM (which invented the PC as most of us know it, in 1982) gave up generations ago. But it’s still alive and well in big companies of nearly all other kinds. Cars would continue to break down and even cause accidents, but it wouldn’t take a Congressional hearing to figure out why. Hat tip to Bart Stevens of iChoosr for sharing Robin’s piece with fellow VRooMers.